1. 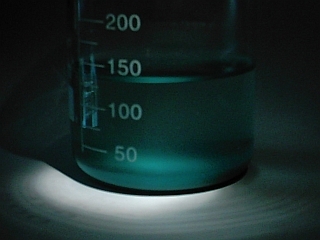 Three 9 volt batteries were connected in series (they snap together) to form a 27v DC power source, and a solution of salt water was prepared by dissolving 1 tablespoon of salt in 2 cups of water. A 3 gram gold coin was spilt into 2 halves to make electrodes. One electrode was connected to the positive side of the battery series and the other gold electrode was connect to the negative using tape and wire. 2. The electrodes were immersed in the salt water solution. Hydrogen gas is released, and it causes brain damage in pure form so this was done outside. The batteries drained quickly and became very hot. The reaction was stopped when they were too hot and were allowed to cool down, then electrolysis was continued. This was done for 30 mins. As this is happening gold is also coming off the cathode electrode into the solution and it can be seen as a yellow hue floating on the bottom of the beaker. 3. The gold that went into the salt water solution was ignored and discarded and attention was turned to the electrodes instead. 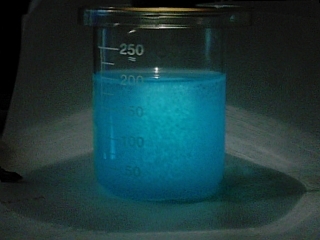 They were both dissolved separately in Aqua Regia solutions of 50ml. I didn't think at the time to remember which one was the anode and which was the cathode. But one of them had a white film covering the outside - this was probably the anode. 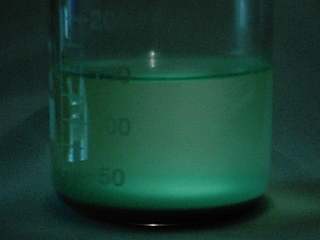 After they had dissolved in the acid, one turned green after 3 days, and the other had a small amount of white powder at the bottom that wouldn't dissolve. Fresh Aqua Regia was added but the white powder still didn't dissolve. Pictured below are the solutions. 4. 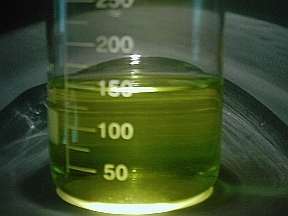 The green solution was chosen to work with for now since it was already showing a color very different from normal gold chloride. 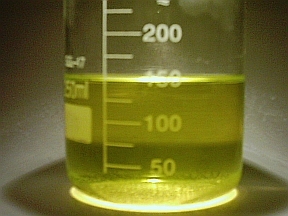 It was diluted with 100ml of water, and it now looked more yellow than green, as can be seen in this photo above. 5. Now the pH was adjust to 14. 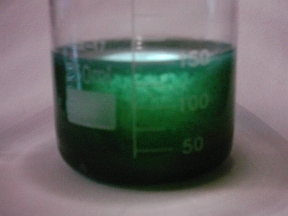 It was necessary to use pure NaOH crystals because there was so much acid. This is dangerous since bases and acids react strongly. Almost an entire cup of NaOH crystals was required to get the pH to finally flip to the alkaline side. 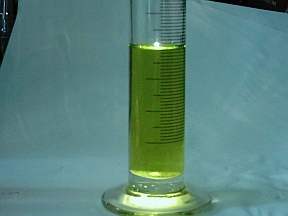 Gold hydroxide precipitates best between pH 8 and 9 and at pH 14 it is a little soluble in the solution. That's why the solution is yellow in this photo. 6. The water was poured off, and more water was added, and the precipitant settled to the bottom again after a few hours. These washes were repeated until the pH neutralized. 7. 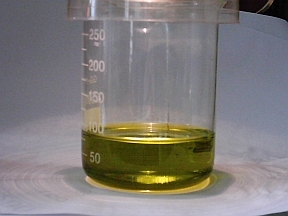 Most of the water was removed from the gold hydroxide precipitant, and 10 drops of 30% hydrochloric acid was added. 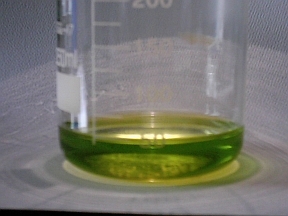 The gold chloride now has a more emerald color. 8. The solution was again diluted to 150ml with water. 9. And the gold hydroxide was precipitated out. 10. 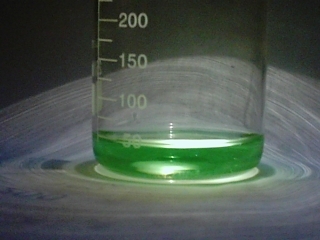 These 2 photos show the precipitant settling out of solution. 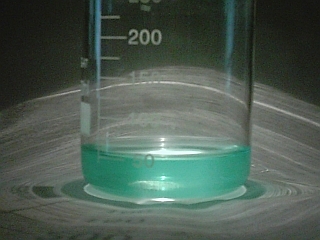 The solution is green, but the precipitant is pure blue. 11. Here it is after a the first wash.
12. 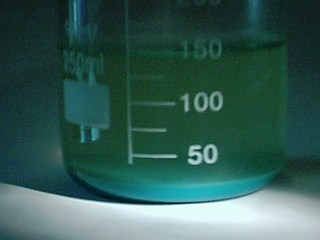 And the precipitant settling out of solution after the final wash. Now a beautiful cyan blue. 13. 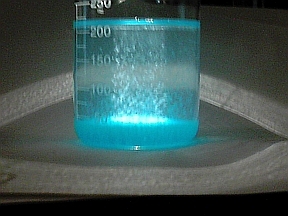 Acid was again added to make gold chloride. It's now more of a kelly green. 14. It was diluted with water then precipitated with NaOH again. 15. Here the color of the precipitant can be seen better. It's an even cleaner blue than photo 11. 16. It was washed, and acidified again. Now it's no longer green but a marvelous turquoise. 17. 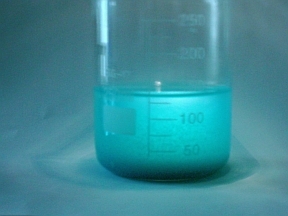 After another precipitation, the color is a very different blue, much less cyan. 18. 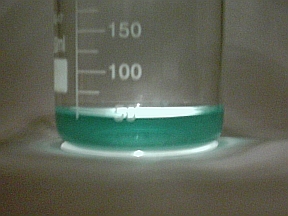 After being washed and acidified the gold chloride is now a turquoise with a more blue tint. 19. Here you can see it precipitating in the beam of a flash light. 20. And here it is finally settled. Notice how much more fluffy it is then the previous photos. It took a long time to settle because it kept hydrolyzing with the water and floating back to the top attached to tiny bubbles. 21. 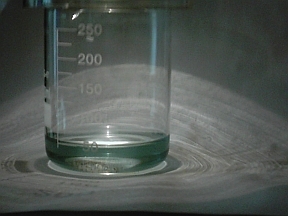 The final solution of the gold chloride. When the acid was added to the gold hydroxide, it didn't have any color at all until a few minutes later. Then in about 30 mins. it took on a very slight gray-blue tint. This experiment was to simply show that electrolysis (and perhaps electricity in general) does have some sort of affect on the gold. It is highly abnormal for these colors to present themselves in this way. If the pH Swing process is carried out on the gold exactly as it's detailed on the Metal Calx page, then a white gold hydroxide precipitant is formed in just 10 swings. 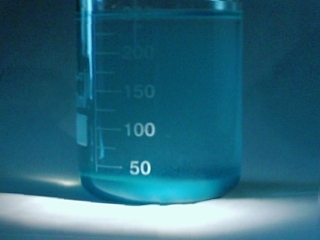 But if pure sodium hydroxide is added to the solution instead, the color changes are slower, which is normally what you don't want. Done this way, the precipitants of gold hydroxide will follow this color scheme - black, purple, red, pink, white. 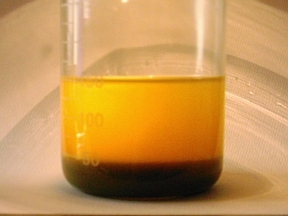 And the colors of the gold in chloride form will go from yellow to orange, then clear. 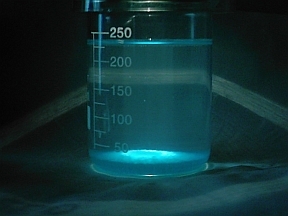 The blues and greens are the ellusive colors which won't form like the above photos unless electrolysis is first done with the gold as an electrode. 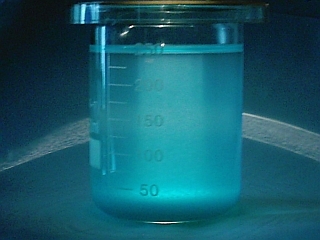 This blue gold hydroxide precipitant can now be taken through the process of making a Tincture, and it most likely will give a blue tincture with properties very different from the red. A sort of "high-tech" tincture which the old alchemists never had the luxury of trying.